A series of reports were issued yesterday in Brussels. Amongst the information were links to the EU’s own information about the effectiveness of the Single Market for the individual member states. Pro-Brexit Facts4EU.Org has analysed the figures and we present a summary which we believe should be required reading for all Remainer MPs. “Trade integration” refers to the percentage of a country’s GDP that is accounted for by trade with other EU countries (imports and exports). It is the fundamental measure of how well a country does from its Single Market membership. HOW DOES THIS RELATE TO MRS MAY’S BREXIT WHITE PAPER? The majority of people will know that much of the debate surrounding Brexit relates to the Single Market. Remain-supporting MPs – including those claiming to want to ‘respect the vote of the British people’ – are continuing to argue that membership of the Single Market or the equivalent is essential to the United Kingdom. Membership of the Single Market – or something very close to it – would require abeyance of the so-called “four freedoms” which include free movement of people. This is why the unelected civil servants in No.10 who form the ‘Europe Unit’ have drafted the White Paper for Mrs May in such a way that Brexit would in fact resemble Remain, but without the ability to have a say on anything. 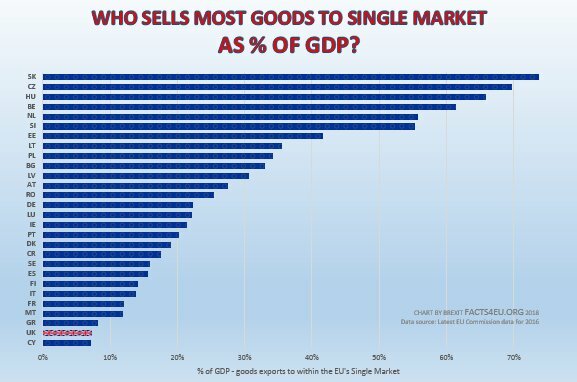 WHAT ABOUT UK EXPORTS INTO THE SINGLE MARKET? Just in case you’re a Remainer MP and you think we’ve been selective with the data we chose for the chart above, sorry but you’re wrong. Below is a chart showing the EU Commission’s figures for goods exports into the Single Market. (The chart above showed the percentage of GDP of goods imports and exports added together.) It’s even lower when you only look at UK goods exports. According to the EU Commission, UK goods exports into the EU’s Single Market account for only 7.3% of UK GDP. By anyone’s reckoning that’s not an enormous slice of the UK economy. A key part of the White Paper relates to UK businesses having to maintain ‘regulatory alignment’ with the EU. This is the ‘common rule book’ which Mrs May is now promoting. In reality this is of course the EU rule book. The Prime Minister advocates retaining this in perpetuity, thereby binding British manufacturers to EU rules present and future, but with no say for the UK going forward. 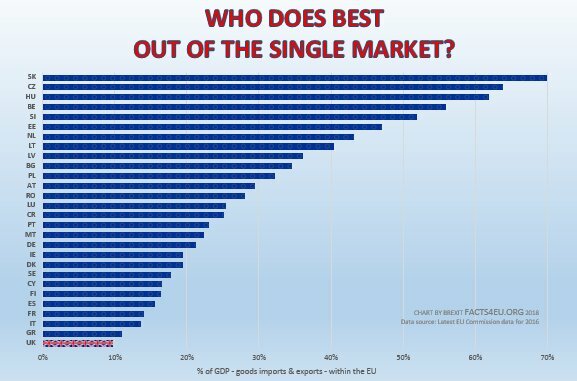 As you can see, the UK benefits least out of all the EU’s member states when it comes to membership of the Single Market. If the UK benefits least, inevitably all the other countries benefit more. For some, it has been an essential part of their economic success. If Remainer MPs would like more information on the facts of the Single Market – rather than its imagined benefits – we have a great deal more information which we have produced in the last three years. All of this is based on official sources and is incontrovertible. We would be happy to make it available to any MPs who are interested in the facts rather than the fiction of the Single Market. The information we have provided above is yet another in a line of important pieces of research which Brexit Facts4EU.Org has conducted to see whether membership of the Single Market is as important as Remainers claim. Every day in Parliament you will hear Remainer MPs extolling the virtues of the Single Market, as if we had never had a Referendum and a General Election in which the majority of people voted to leave the EU, including the Single Market. Many Remainer MPs are telling the public that the Single Market is so important that exit from it will result in economic catastrophes and massive job losses. Our report above shows unequivocally that the Single Market has been of great benefit to many other countries, but that the UK comes bottom of the list. 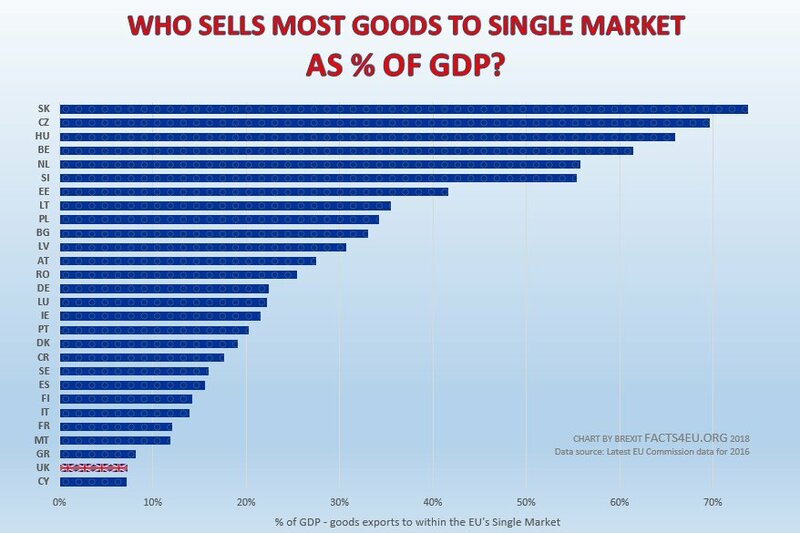 This is despite the fact that the Single Market is sold as one of the defining benefits of EU membership. It is also despite the fact that the UK is the second-highest net contributor to the EU’s funds. In other words, the UK is the second-biggest payer, but at the end of the queue when it comes to benefiting from that. The facts above come from the EU Commission itself. At Brexit Facts4EU.Org we generally try to quote facts from the EU because then it’s impossible for Remainer MPs to refute them. Don’t you think the above facts need to be known? Whilst we have some success in getting our information into the national press – and used by some pro-Brexit MPs – we need to promote facts like these more widely. If you read us but haven’t yet made a donation to keep us going, now is the moment. With some donations today we could invest in the time needed to circulate this information to more MPs and to the mainstream media. It’s the weekend but we’ll do it if you could back us. Journalists and politicians can contact us for the full list of links. With an avg. 1.2M voters per MEP & Britain with 16% of EU GDP and 13% of the EU’s population yet having only 8% (if united) say, whilst holding less than 3% of the various offices within the EU Do note The EUropean Parliament has no ability to make policy and has a Commission of unelected bureaucrats, thus clearly the EU is not even a pretence of being a democracy despite its protestations! Do note that many senior apparatchicks and even elected politicians speak openly of the ‘Post Democratic era’ with no sense of shame or irony and in complete contempt of the so called electorate – yet The EU & many of its vassal States/Regions are all too willing to slaughter people in Sovereign States, to impose The EU’s chosen brand of democracy on them! Now as President Junker announced in his ‘State of the union’ speech 2017 the aim is to create an EU military force and centralise ever more of the decision making and control! France and the Netherlands voted against the proposed EU constitution in 2005, only to have those votes ignored. Ireland voted against ratifying the Lisbon treaty in 2008, but then later under pressure & threats had to change its mind. Greece for me was the final straw. It became clear in 2015 that it didn’t matter which way the Greek people voted. The birthplace of democracy had become its tomb. That was enough. I was going to vote to leave the EU when the chance came. No political party of any significance in Britain took active steps to achieve a Referendum – the task was eventually taken by an Indipendent West Midlands MEP Nikki Sinclaire who personally launched and funded the gathering of a petition of 225,000 signatures delivered to Parliament via Downing Street, thus forcing a debate in the House of Commons on an IN/OUT Referendum, which led to David Cameron’s first consequential rebellion. It was due to winning that debate, officially opposed by every party including Ukip that David Cameron was forced to include a promise of an IN/OUT Referendum in the Tory Manifesto at the next General Election. The rest is history & despite no Parliamentary Party backing the OUT vote & Government spending Millions of Pounds of public money leafletting & promoting ‘Project Fear’ to try to persuade the British people to Remain just as they had at the first Referendum in 1975 – This time their lies and threats were not heeded and in the largest vote in British history Britain voted by a clear majority to Leave. Nikki Sinclaire’s OUT result left Cameron & his co conspirator Osborne with no option but to resign, sadly some of the other traitors have remained to try to hinder progress to BreXit, aided by their corrupt allies in the EU and \eu funding and bribes! There will be little or no change in Britain’s economic position, if we leave the EU, using a better negotiated, customised & updated version of the ‘Norway Model’ as a stepping stone to becoming a full member of the Eropean Economic Area, where all will benefit, as we secure trade relations with the EU’s vassal regions, with an EFTA style status and can trade and negotiate independently on the global stage, as members of The Commonwealth and the Anglosphere. This is of course dependent on a modicum of intelligence on the part of Britain’s politicians and negotiators but it also requires the integrity of Parliament to uphod democracy and the integrity of EU politicuians & apparchicks to act ethically and without their normal vindictive mallice. I believe Leaving the EU will be turned into something of a rough ride by the ignorant and the corrupt but I have no doubt that in the long run Leaving the EU will prove conclusively to be in the best interests of Britain and our true allies. I also believe that Britain leaving the EU will prove to be the catalyst to great changes within the EU and hopefully its democratisation as without great changes it is indubitably doomed. It will take many years to rectify the mess our political class got us into and we have no other peacefull means by which to extricate ourselves than to depend on that self same self styled elite, who all too often forget they work for us! One huge benefit of BreXit will be that we can negotiate with bodies like the WTO, UN, WHO, IMF, CODEX and the like, directly, in our own interest and that of our partners around the world, in both the Commonwealth and the Anglosphere at large; rather than having negotiations and terms imposed by unelected EU bureacrats and their interpretation of the rules handed down, as if they were some great achievement of the EU’s!